It is no secret that modern day life is rife with stress. While many of us have become experts at adapting to and performing under stressful conditions, the truth is that chronic stress takes its toll on all aspects of our health: physical, mental, emotional, and spiritual. The Herbal Self-Care for Stress Management Course explores stress and its effects on wellbeing and then delves into the holistic approach to self-care for stress management. 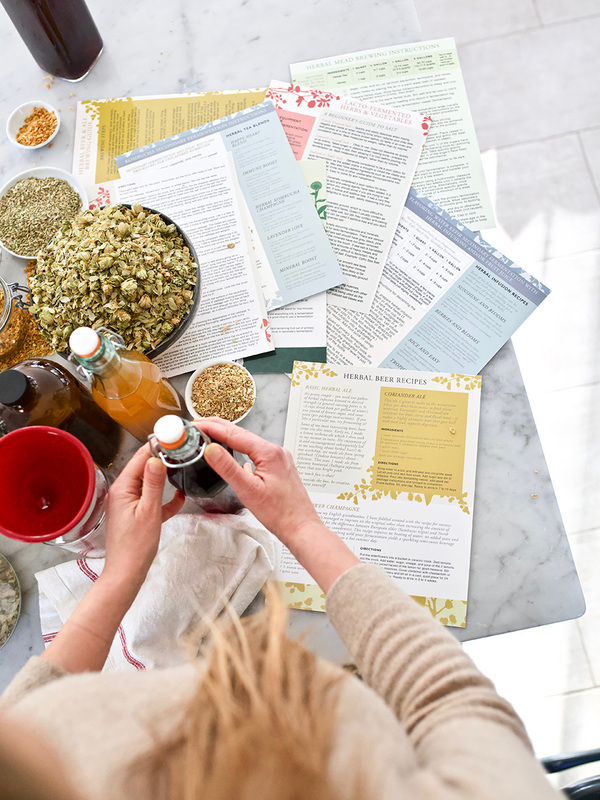 You’ll walk away with an understanding of the nutritional choices, lifestyle practices, and herbs that can transform your response to stress and enhance your wellbeing. Ready to de-stress? Join us! Ever feel overwhelmed? There’s a pretty good chance that with our busy modern lifestyles, your answer is a resounding “Yes!” At the Herbal Academy we are committed to supporting our students to achieve vibrant wellness through an enriching relationship with plants. The Herbal Self-Care for Stress Management Course will teach you how to do just that! We have enlisted several outstanding Herbal Academy teachers to develop an insightful—and practical—look at the role stress plays in the physical and emotional imbalances we face and the ways in which food, lifestyle, and herbal support can help us regain balance and build resilience. Video and written lessons, visual and audio tutorials, and engaging digital presentations will make you feel like you’re in the classroom with us! Herbal Academy course development director and clinical herbalist Erika Galentin, RH (AHG), MNMIH is joined by clinical herbalists Pamela Spence, MNMIH, Veda West, MNMIH, Lisa Olson, Heather Irvine, and Naomi Ullian, clinical aromatherapist Sherilyn Roach, and the Herbal Academy team in this comprehensive three unit, twelve lesson course. Learn about the course teachers here. Whether you are brand new to using herbs to support your wellness or are more experienced, this course offers the why and the how of fortifying yourself against the stressors of daily life using the holistic approach. You’ll walk away with the tools and resources you’ll need to start making the changes that can make a big difference in your relationship with stress and its effects on you. What does it mean to be “well”? What is allostatic load, and how does it affect homeostasis? What causes us stress? Deadlines and finances, but what else? How does stress affect us physically? How does it impact us emotionally? What are some traditional healing perspectives on the effects of stress? What is our “second brain?” Where is it located? How are stress and digestion related? How does the gut microbiome affect digestive and emotional health? Which probiotic supplements have been shown to have the most impact on supporting the gut-brain connection? Which foods can help with my stress response, digestion, and blood sugar management? Which vitamins, minerals, and other trace nutrients are important, and how much? What are some eating tips to support good digestion? Which types of exercise can be helpful for managing stress? What is abhyanga oil massage? You’ll learn how to do it! The value of breathwork and meditation—enjoy a guided breathing exercise and guided savasana. 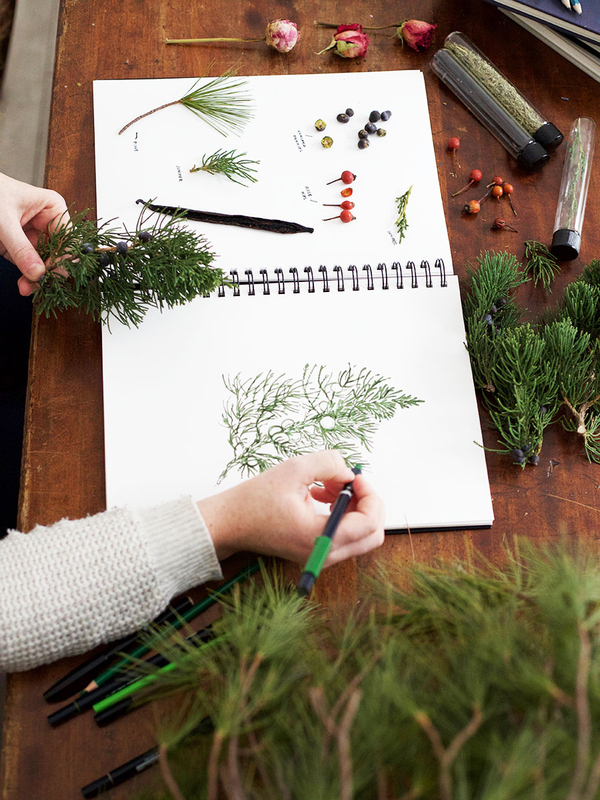 Connection with nature, people, and your creative side provides deep nourishment. There’s no substitute for a good night’s sleep! Cultivating healthy sleep habits. How can essential oils help with stress management, and which ones? 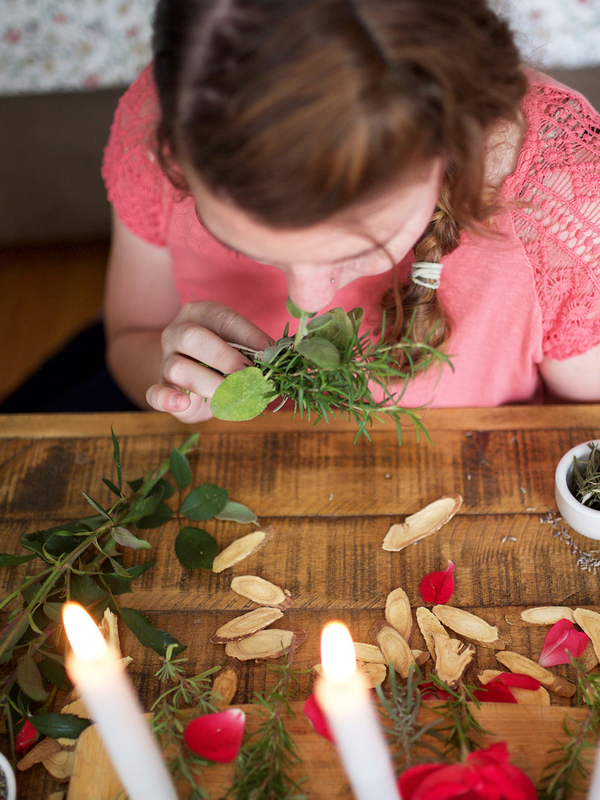 Create an aromatherapy blend with the help of a guided tutorial. Learn to administer essential oils safely. What are herbal actions and energetics? How do herbs work, anyway? Herbal contraindications, interactions, safety, and dosage. When is it time to see a clinical herbalist? The important differences between whole herbs and herbal supplements. What are nervine herbs, and which ones are good for stress? How can adaptogenic herbs help? When to enlist sedative herbs and which ones can be helpful. Learn more about each herb via detailed plant monographs. How to make basic herbal preparations such as infusions, decoctions, and tinctures! 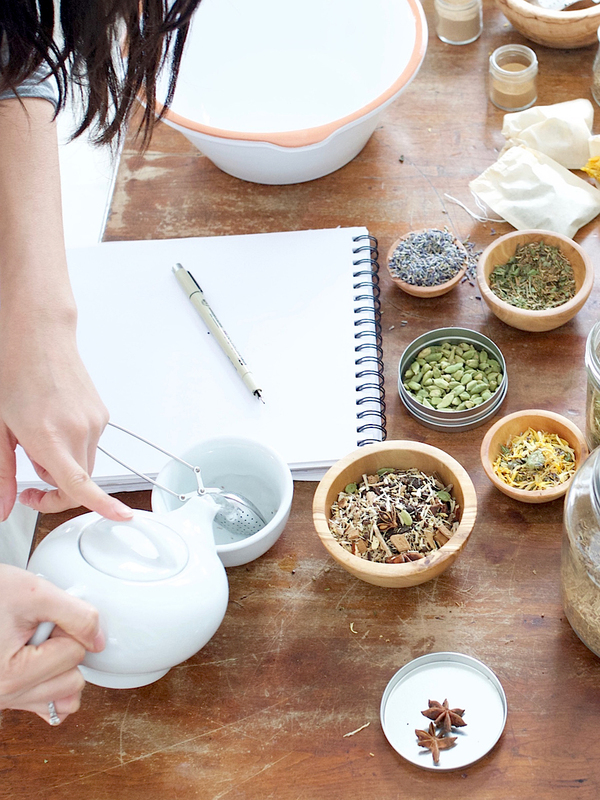 Getting to know herbs one and a time—learn how with a guided tea tasting. How to make a tea blend with a helpful video tutorial! Learn about herbs to start incorporating in your self-care routine. Save on your herbs and supplies with exclusive student discounts from Bulk Herb Store and other herbal partners. The course begins by defining the holistic approach to wellbeing, which looks at the whole picture to ascertain patterns of imbalance and utilizes nutritional, lifestyle, and herbal approaches to address those imbalances. Learn about sources of stress, the nervous and endocrine systems as key players in the stress response, and the physiology of the body’s response to stress and how it seeks to achieve homeostasis. Then explore the effects of long-term stress on physical and emotional wellbeing, how chronic stress can contribute to cardiovascular disease, chronic pain, and reproductive and mental health challenges. We’ll even highlight some key Western and non-Western concepts surrounding the definition and origins of stress. This unit discusses both nutritional and lifestyle stress management practices and tools, focusing on the concept of self-care and the steps an individual can take to support their resilience to stress. Join us as we explore the role of digestive vitality in stress management and discuss the enteric nervous system (our “second brain”) and the intestinal microbiome and their role in how we think, feel, and respond to stress. We’ll discuss nutritional self-care during times of stress, how to support digestion, and the use of foods and specific supplements to nourish the nervous and endocrine systems and fortify the body against the negative and depleting effects of chronic stress. Learn about about how different lifestyle practices and good quality sleep may help allay the negative physical and emotional effects of chronic stress. We’ll explore why these practices are beneficial as a stress management tool. And finally, wrap up with a discussion on the use of essential oils and aromatherapy as a centering, grounding, and calming stress management tool. And finally, the herbs! This unit is designed to teach the appropriate and safe use of herbs as additional tools for stress management. You’ll revisit the concept of the holistic herbal approach, touch on herbal actions and energetics, and then delve into a discussion on herbal safety –– especially in regards to herb-drug interactions, communicating with your healthcare team, seeking the advice of a clinical herbalist, and the benefit of working with whole herbs. You’ll learn three main categories of herbs (nervines, adaptogens, and sedatives) which can be used for both physical and emotional support. Several herbs from each category are discussed and explored through visual presentations and insightful plant monographs. Finally, you’ll discover how to make basic herbal preparations such as infusions, decoctions, and tinctures; how to create a personalized tea blend; how to get to know plants one herb at a time by doing a tea tasting; and important dosage considerations for teas and tinctures. This entire course is designed to empower and support you in your stress management quest with the herbal self-care approach! Discover what “herbal” self-care really means—much more than just taking herbs when we are frazzled or blue or tired. You’ll walk away with integrated nutritional, lifestyle, and herbal practices to strengthen, nourish, and support yourself both physically, emotionally, and even spiritually. This approach is practical, empowering, and deeply nourishing. So what are you waiting for? You deserve the deep support that the Herbal Self-Care for Stress Management Course has to offer you! Hurry on over to sign up for class today—or perhaps we should say take a deep breath and saunter on over! DISCLAIMER: The information presented in this course is for educational purposes only and is not intended to diagnose, treat, cure, or prevent any disease. Check with your healthcare provider first if you have concerns about your health. In addition, you should speak with your healthcare provider or pharmacist before making adjustments to your diet or lifestyle and prior to introducing herbal and nutritional supplements as they may affect any treatment you may be receiving. You are advised to disclose any and all nutrient and herb supplements you are using to your healthcare team.